In collaboration with the Environmental Research Institute of the Supervising Scientist (eriss), Supervising Scientist Branch, Department of the Environment and Energy. Hydrobiology R&D team investigated whether Cu and Ni measured by the Diffusive Gradients in Thin Films (DGT) technique are equivalent to the bioavailable concentration of Cu and Ni that causes toxicity to a local tropical alga (Chlorella sp.). The anticipated application of the outcome of this study would be to develop more realistic tools to monitor and assess environmental risks to the aquatic ecosystem in river receiving mine water discharges through a more accurate measurement of the bioavailable fraction of metal contaminants. 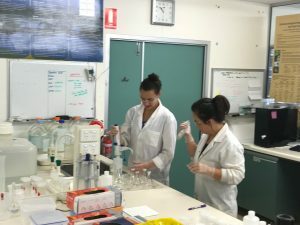 Photo: Trang Huynh (Hydrobiology) and Ceiwen Peace (erris) were at the erris ecotoxicology laboratory conducting a series of ecotoxicity assays using Chlorella sp. that is known to be sensitive to Cu and Ni. Bioassay were performed in concurrence with DGT measurements of the test waters. Chlorella sp. served as bioassays, sensu stricto, for bioavailable Cu/Ni and were then cross checked against the Cu and Ni concentrations measured by DGT.